The Bownet is 7'x7'. Sets up in 2 minutes with one person. Soft toss net and can be used as a protective screen. Shipping 18.00 lower 48 states. HI and AK 35.00. 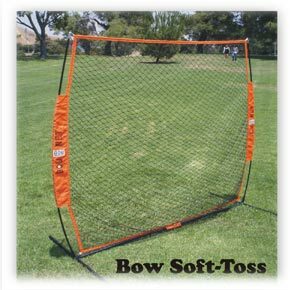 This is a great soft toss net to be used indoors and out on the field. Very light weight and portable and does not blow down. This net is new on the market and is really catching on. Comes with pads on the feet so not to scratch floors.